Hello! My name is David Henderson and I'm the webmaster and author of the book Sunshine Skies: Historic Commuter Airlines of Florida and Georgia. Thanks for visiting! As the son of a retired Delta pilot, I grew up under the flight path of Atlanta airport and have been fascinated by commercial aviation from as early as I can remember. 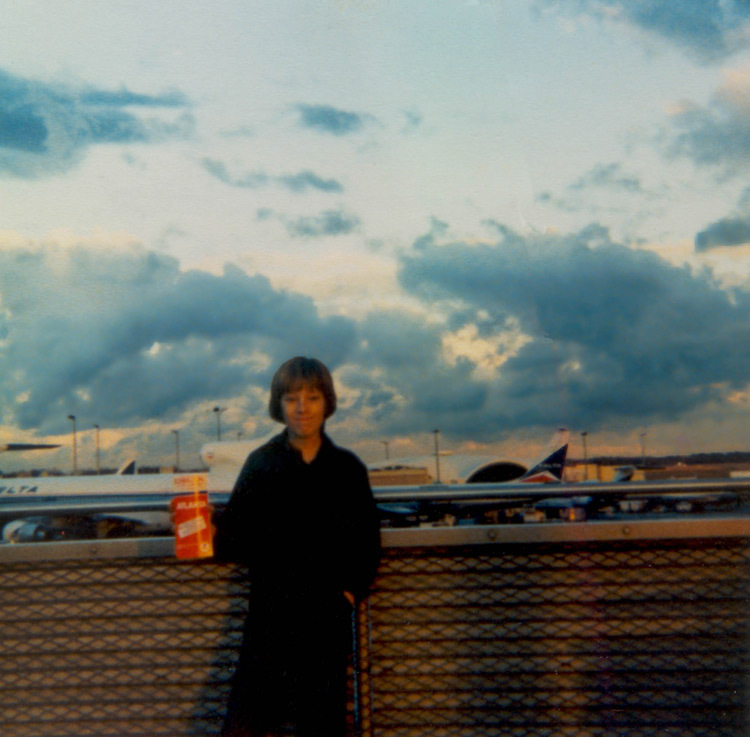 Here I am in December 1979 at one of my favorite childhood hangouts: the observation deck at the old Atlanta airport terminal. The purpose of Sunshine Skies is to explore, preserve and share the commercial aviation history of the southeastern United States with an emphasis on commuter airlines of Florida and Georgia, the history of Atlanta airport, and old "propliners", particularly the Douglas DC-3. My grandparents lived in Miami and we visited once or twice a year. Miami International in the 1970s was probably the greatest airport in the world for anyone interested in airliners. It was commonplace to see ancient Lockheed Constellations, Stratocruisers, DC-4s, sixes and sevens lined up for take off between shiny new 747s and A-300s. In the 1980s it was not unusual to see 1930s-vintage DC-3s parked next to a supersonic Concorde. The grandparents moved to the Keys in the mid 70s and the closest airport, Marathon, was served by the DC-3s and Convairs of Air Sunshine. It was also home to a fleet of mosquito control DC-3s that regularly buzzed the house at treetop level at sunrise. Far away from the modern hustle and bustle of my hometown Atlanta, the Keys felt like the land that time forgot and these aircraft seemed like relics from a forgotten prehistoric age. I was in awe of it all. My love of old "propliners" and small commuter airlines and fascination with the commercial aviation history of the southeastern USA began during that time. 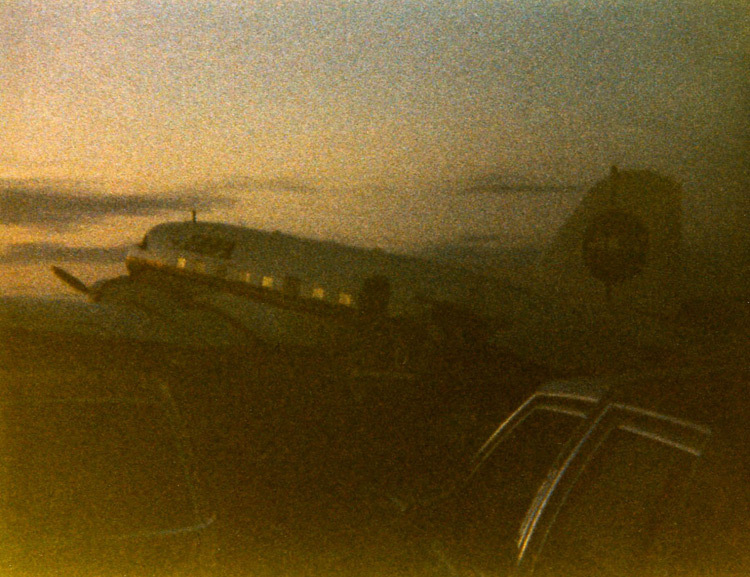 I mowed yards and raked leaves and saved up $32 for my first DC-3 flight from Miami to Marathon on December 27, 1981. Absolutely fantastic! The sun was setting into the ocean as we turned for final into Marathon and twilight settled as we pulled up to the terminal. I took this grainy photo (anyone remember Disc cameras?) from the parking lot, my grandparents' car in the foreground. In the late 1990s my interest in these old aircraft and airlines was re-ignited by a combination of the internet and a brief propliner renaissance in the Atlanta area. I was in my 30s and once again driving all over north Georgia to photograph DC-3s, collecting timetables through ebay and connecting with others with similar interests. It was like being a kid again. In December 2005, I published the book Sunshine Skies: Historic Commuter Airlines of Florida and Georgia and the expanded second edition and the Sunshine Skies website appeared in October 2008. The book and website have brought some great opportunities and allowed me to connect with hundreds of fellow aviation fans, industry employees and media contacts. Early on, I became involved with the National Museum of Commercial Aviation in Atlanta, volunteering and taking part in book signings and other events. In 2009 I appeared as a guest speaker at the Airliners International convention in Orlando. Below: Georgia Governor Sonny Perdue, at left, receives a copy of Sunshine Skies from National Museum of Commercial Aviation Chief Curator and Executive Director Grant Wainscott while attending the Dubai Airshow. In recent years I have been interviewed on radio and in print to provide historical context and information for episodes and articles about Atlanta Hartsfield-Jackson International Airport. 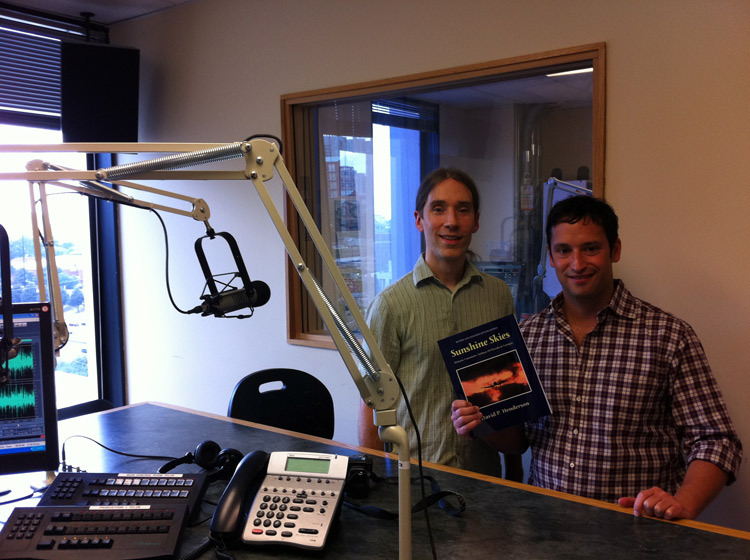 Here I am (on the left) at WMLB 1690 in Atlanta with Sidewalk Radio host Gene Kansas after recording a segment for an episode about Atlanta Hartsfield-Jackson International Airport. Thanks again for your interest and please contact me with your own stories or if you'd like to arrange an interview for an article. Departed Flights - old OAG schedules, route maps, timetables. Very cool site. Timetable Images - timetable covers as well as entire historic timetables are shown here.